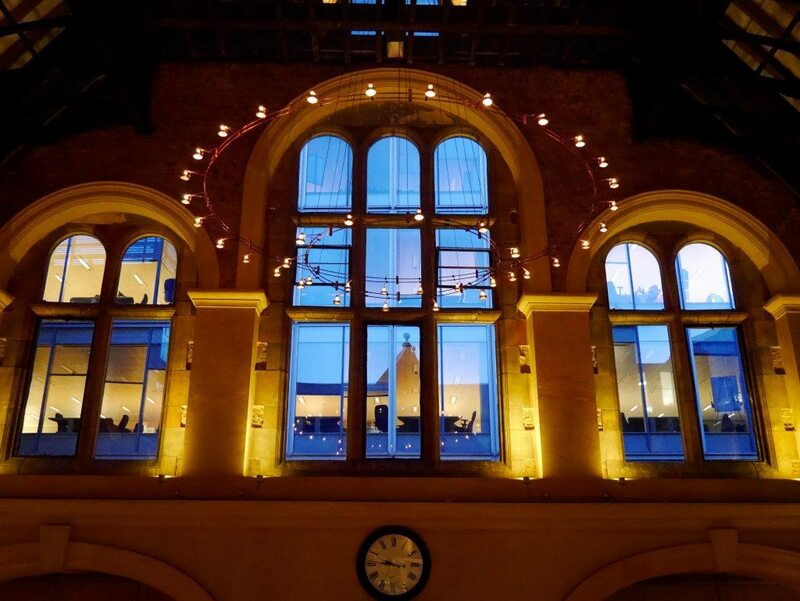 To round up my birthday celebrations, Michael took me for dinner at Galvin la Chapelle, a Michelin-starred restaurant housed in a seriously stunning former Victorian chapel. 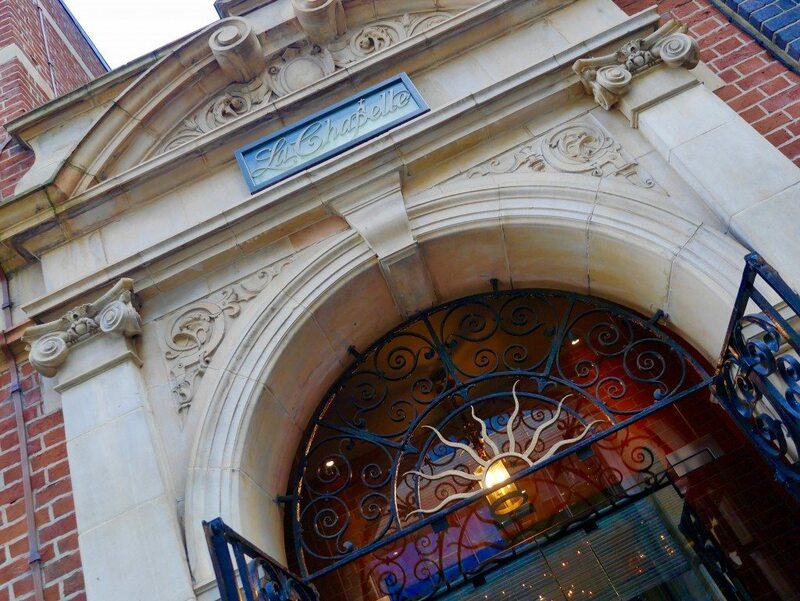 I was blown away by the beauty of the grade II listed building; the warm & impeccable service; the standard of the gourmet modern French cuisine; and, not to mention, the value. 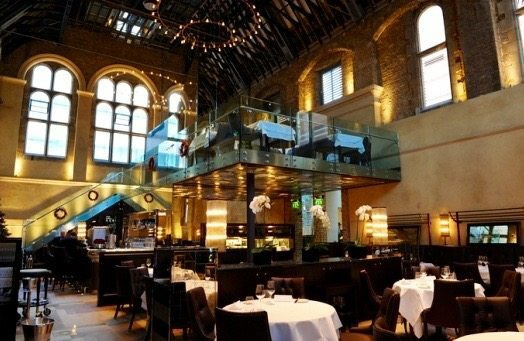 Galvin la Chapelle is one of few restaurants truly worthy of my five chefs hats award! Service: From start to finish, the service could not have been more on point. At first, due to our corner table (the best table in the restaurant, may I add) on the upper floor, and only one waiter designated to the area, I was a little concerned that we would be slightly abandoned. But I could not have been more wrong. Water & wine was constantly topped up, which is an impressive feat for any waiter lumped with serving Michael and I, considering the speed at which we glug. 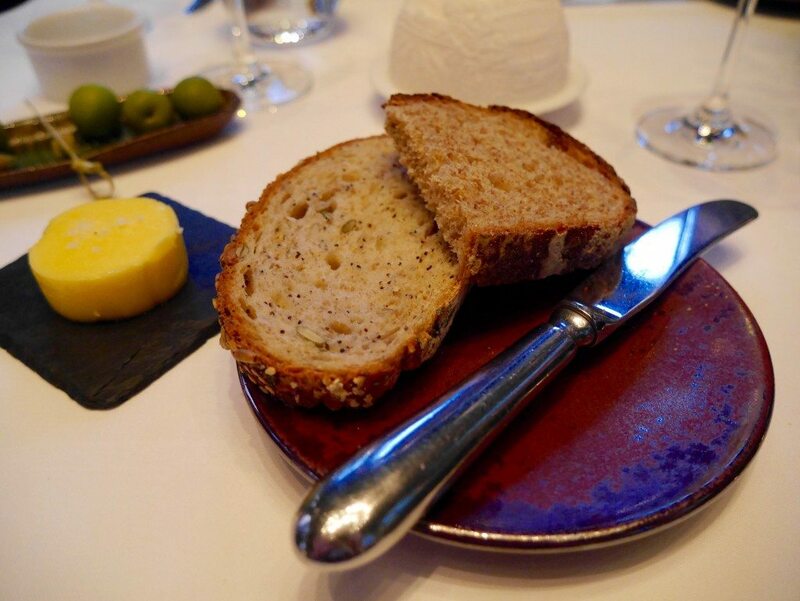 Bread was offered, re-offered, and re-offered, to the point where I actually had to ask the lovely, slightly timid, French waiter to stop offering, because who can refuse delicious, warm bread when one’s plate is clean & tummy is hungry? I certainly cannot. When our main courses arrived, our beautiful hunks of chateaubriand were accompanied by offensive small halves of boiled potatoes, despite clarifying twice with our waiter that the ‘Jersey Royals’ stated in the dish description would NOT be boiled (I simply cannot take this form of potato), and he had assured me that they would be roasted. But as soon as I pointed this out to him, he was most apologetic and swift in bringing us a side of complimentary pommes purée, MUCH to my appreciation. He also delivered a generously filled (free – take note Bob Bob Ricard) jug of extra delectable gravy for me to soak my incredible slab of beef in. 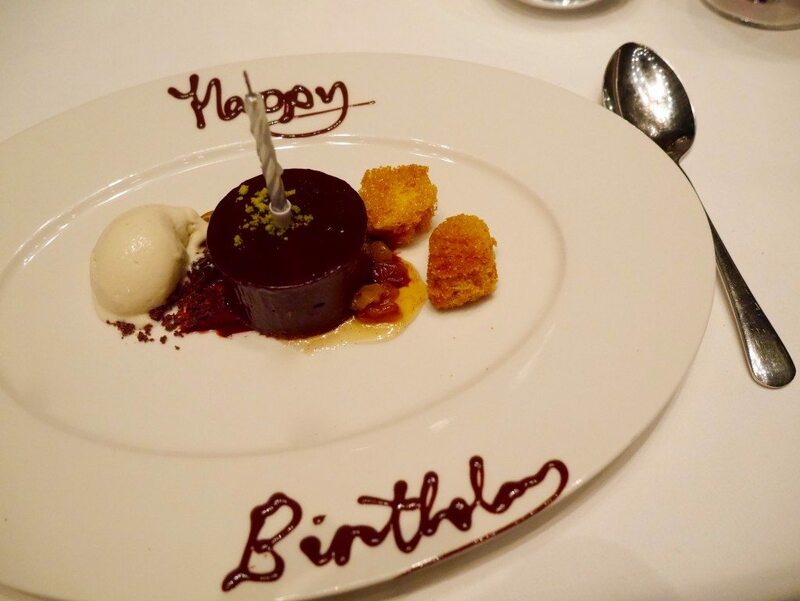 And, last but not least, my dessert was presented with a candle & ‘Happy Birthday’ written in chocolate on the plate. For me, service doesn’t have to be seamless to be perfect; in my humble opinion, it’s how one deals with a situation that makes all of the difference (this is also my motto in life #gettingdeep). Ambience: The chapel was alive & buzzing throughout our entire evening. 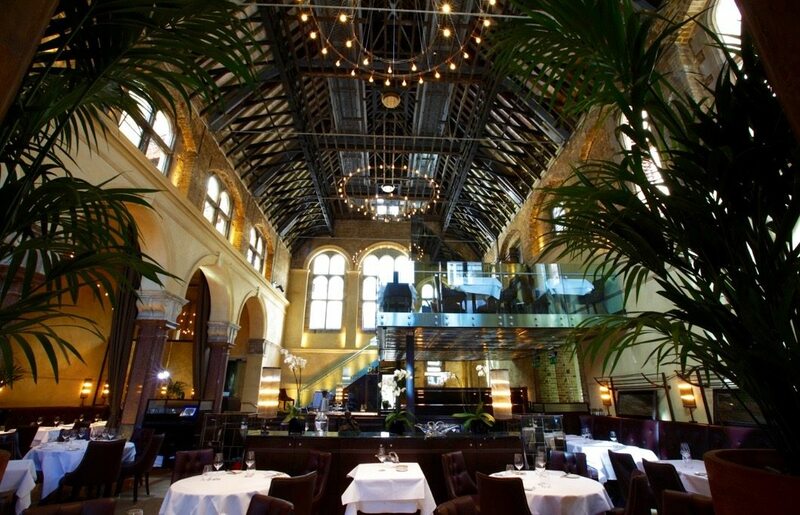 Galvin la Chapelle has successfully combined old & new, to create a spectacular setting in which to enjoy a meal. The dark cherry leather chairs & booths, white tablecloths, heavy curtains and oversized mesmerizing candelabras hanging from the 30-metre vaulted ceiling, are in keeping with the sense of fine tradition and grandeur of the chapel. Meanwhile, the modern glass staircase & open ‘suspended in space’ second level, large green plants and stunning floodlighting (that creates a different mood during both day & night) give a contemporary touch. 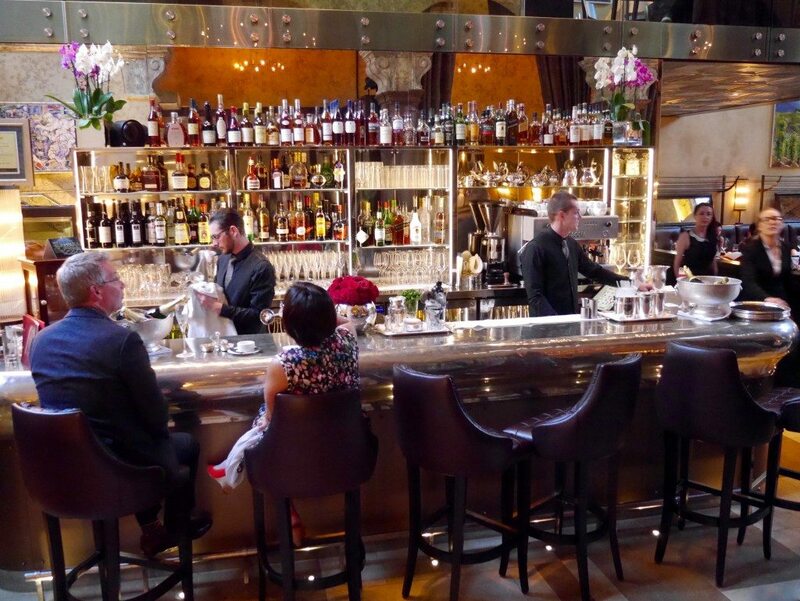 The bar is elegant & classic, and I really like the fact that it is not separate from the main dining room, so that one can enjoy the lively atmosphere. 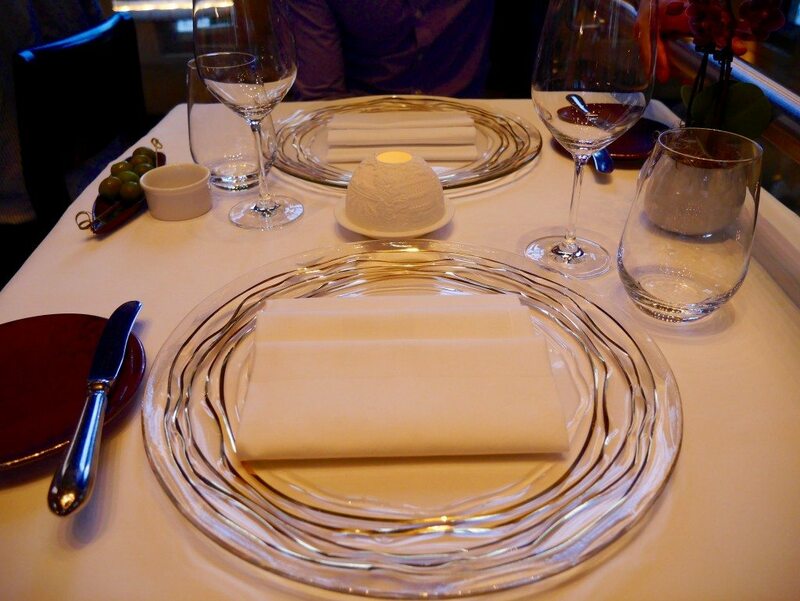 After being served two glasses of complimentary Brut, we were shown to our beautifully laid table; the charger plates got me particularly excited! The view from our table was just ridiculous, and absolutely perfect for people watching. Food: On to more important things, just moments after we had sat down, our waiter offered us a choice of three breads to start with. We shared a slice of seeded and sourdough; the seeded far surpassing the sourdough, which we received plenty(!) more of. 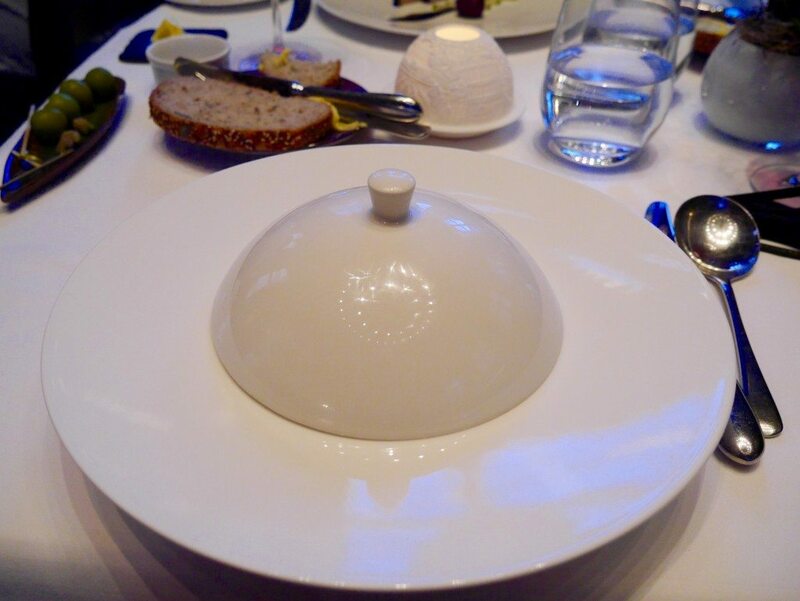 The gourmet ‘new French’ menu was excellent; usually there is always one dish that has the slight edge for me for each course, but I was genuinely spoilt for choice for both starters & dessert (mains was a no brainer…). 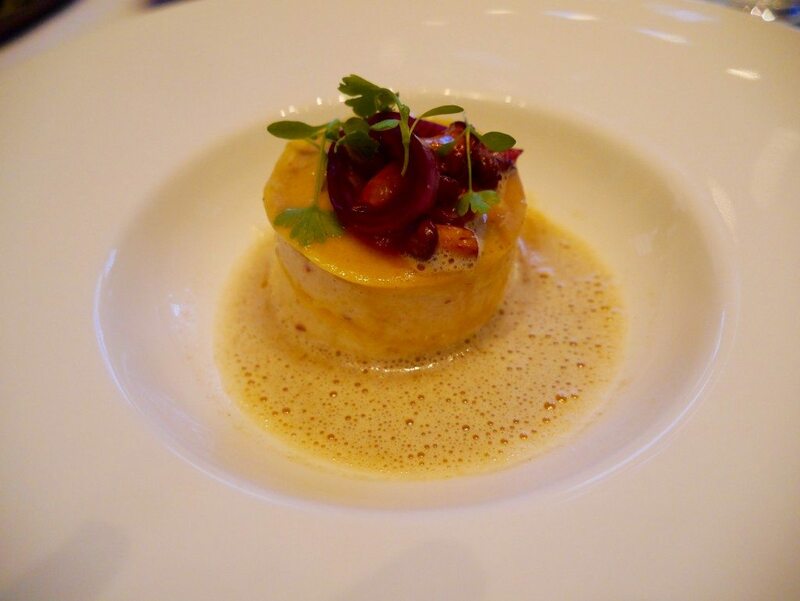 In the end, I opted for the lasagne of Dorset crab, velouté of girolles (£16.50), although I could just as easily have chosen Michael’s dish, ballotine of foie Gras des Landes, cherries and hibiscus (£14.50). My starter arrived with an air of suspense. And it’s fair to say that I was pretty pleased with my plate when the lid was lifted. Exceptionally fine layers of pasta, sandwiching delicate yet decadent layers of smooth crab; the subtle flavours grew with every mouthful and worked well with the small, chewy fungi. A remarkably well-executed starter, and just the right portion size. 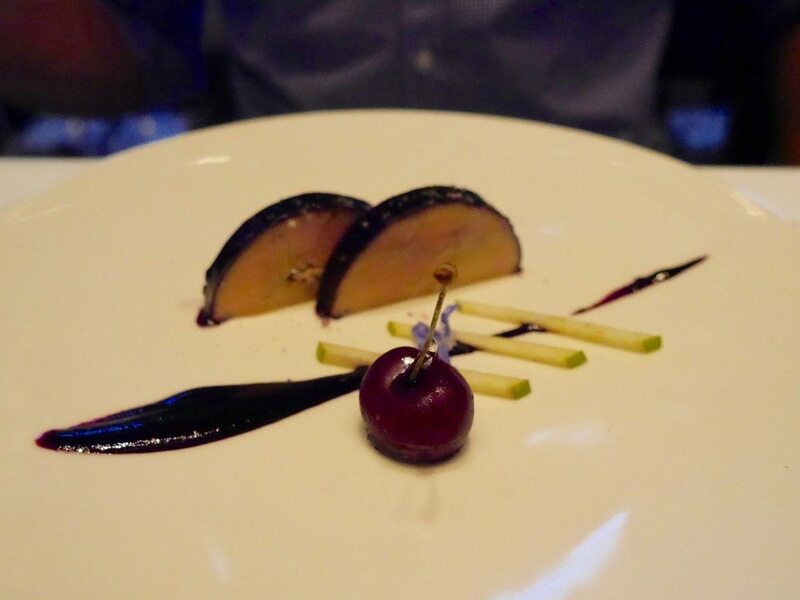 Michael’s ballotine of foie gras was equally on the money. 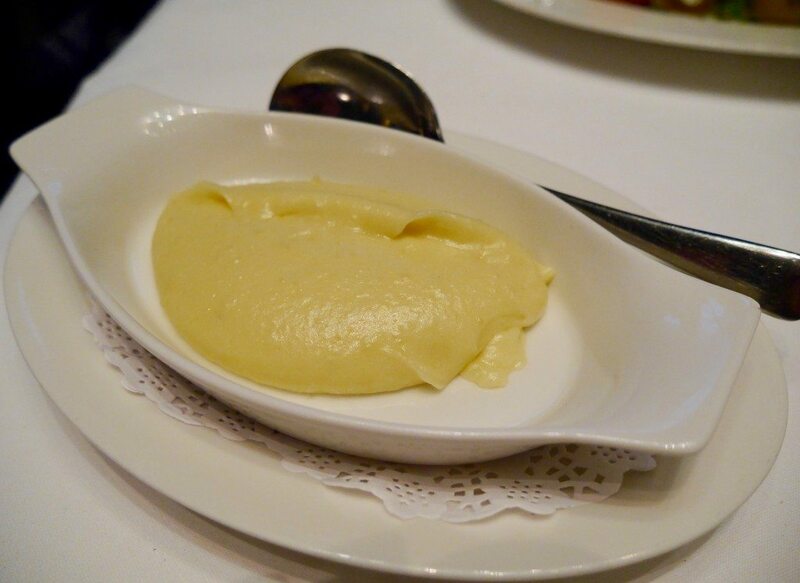 It was buttery rich & smooth, and could easily have been enjoyed as a forkful with just a smear of cherry sauce. 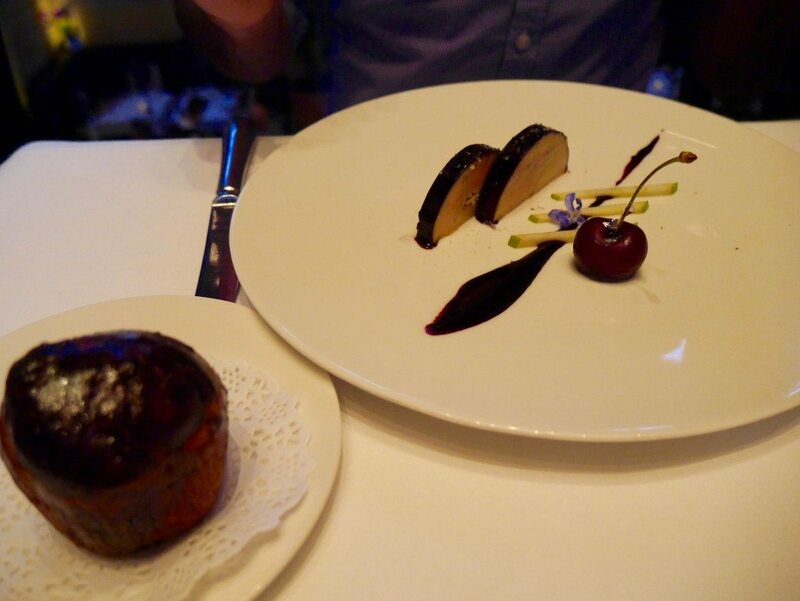 But the accompanying warm & crisp croissant-cross-brioche bun, filled with cool cherry jam, provided the perfect sweet shovel on which to spread the buttery ballotine of foie gras; a real bonus to the dish that skyrocketed the overall finish to the top of the foodie charts. For main course, there was simply no question; we both ordered the roast Chateaubriand of Cumbrian beef, violet artichokes, Jersey Royals & garlic cream (£32.50 each). The roast Chateaubriand had the most intense, smoky flavour and was so tender that I could barely believe it was beef. It was by FAR the best steak that I have ever eaten. High praise indeed. 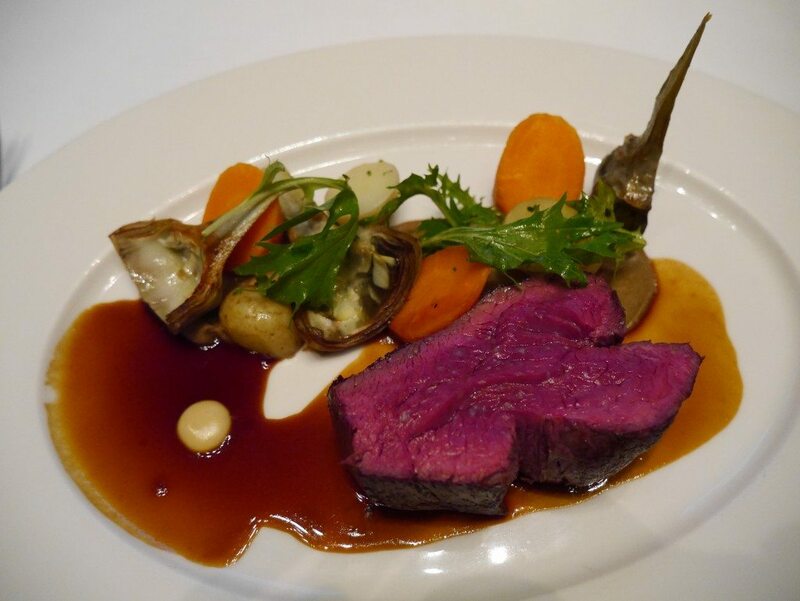 As for the accompaniments, the carrots were a tad soft for my liking, but the artichoke was well-cooked and flavoursome, and the sauce so delicious that I could have married it; I kid you not… it must have reduced for days to have a shine that good, and the strong, red wine flavour could not possibly have complimented the beef better. Pure sauce heaven. As previously mentioned, the Jersey Royals were instantly rejected, but the complimentary pommes purée did the trick very nicely. I loved the mood created by the floodlighting and candelabra as darkness started to fall. And, all too soon, it was time for dessert. Despite contemplating the apple tarte Tatin (£8.50) for some time; in the end, my filthy chocolate habit won me over and we both ordered the chilled Valrhona chocolate fondant, caramelia centre & honeycomb (£11.50 each). It was beautifully presented, with my ‘Happy Birthday’ message written elegantly (and edibly). Wish made, we got stuck in. The first mouthful brought back fond memories of our first ever cold chocolate fondant at Opera Tavern; the thick & smooth outer chocolate wall encased a delicious river of Rolo-esque ooze-y caramel, which was delightful with the sticky crunch of the honeycomb and softening vanilla ice-cream. Despite having strong feelings towards (/against) chocolate with fruit, the soaked sultanas actually added a delicate fruitiness and a soft chew that worked extremely well with the other textures. Dishes licked clean and our bottle of ‘Pinot Noir, Domaine Bruno Sorg, 2013’ (£45.00) well & truly empty, we sat back & soaked up the surrounding merry atmosphere with big smiles; nothing beats a good meal with good company! The wine could also not have been better matched to our meal and, upon reflection, turned out to be from the Loire Valley, which was an amazing coincidence since I had been to a wine tasting dinner hosted by Loire Valley Wines just the night before. 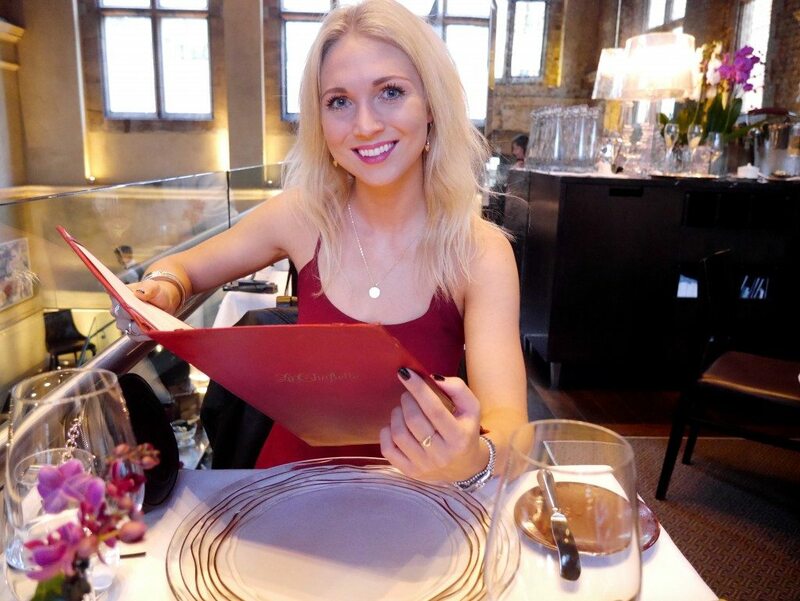 Price: The bill came to £184.50 with service, for 2 starters, 2 mains, 2 desserts, and a bottle of wine (plus 2 free glasses of Brut). 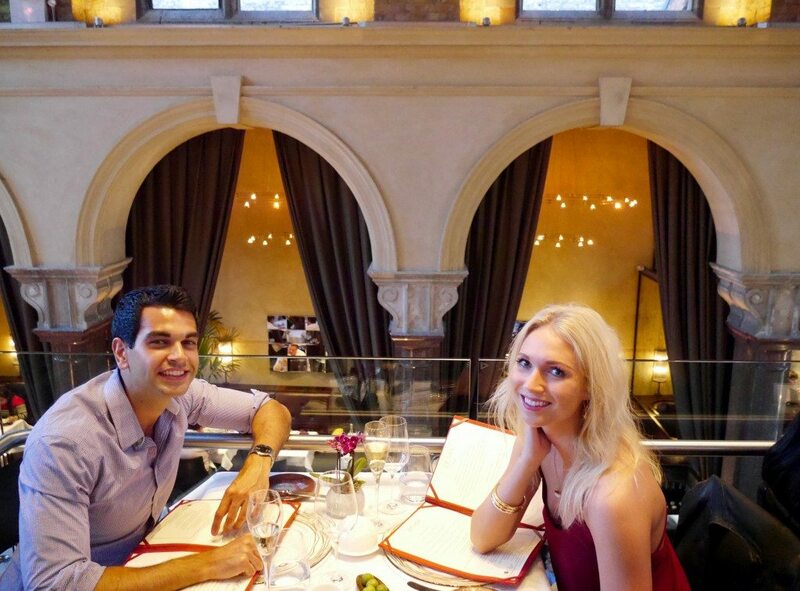 For the quality of the food, setting & service, Michael and I agreed that this was excellent value. 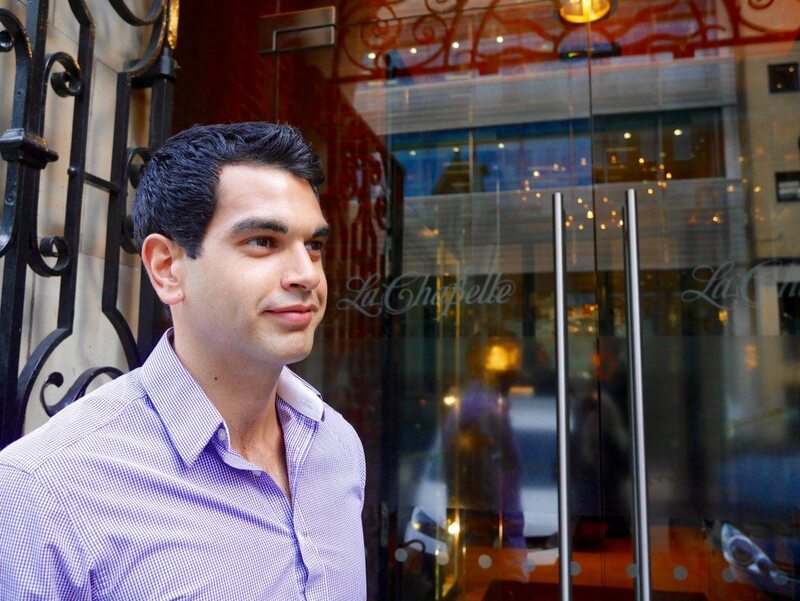 And, having now wined & dined at the wonderful Galvin la Chapelle, it doesn’t surprise me in the slightest that the modern French menu won 8 top restaurant awards in its first year, and gained a Michelin star an impressive one year after opening. I already can’t wait to visit more of the Galvin Restaurants in the near future. That’s quite an impressive round of birthday celebrations that you’ve had! 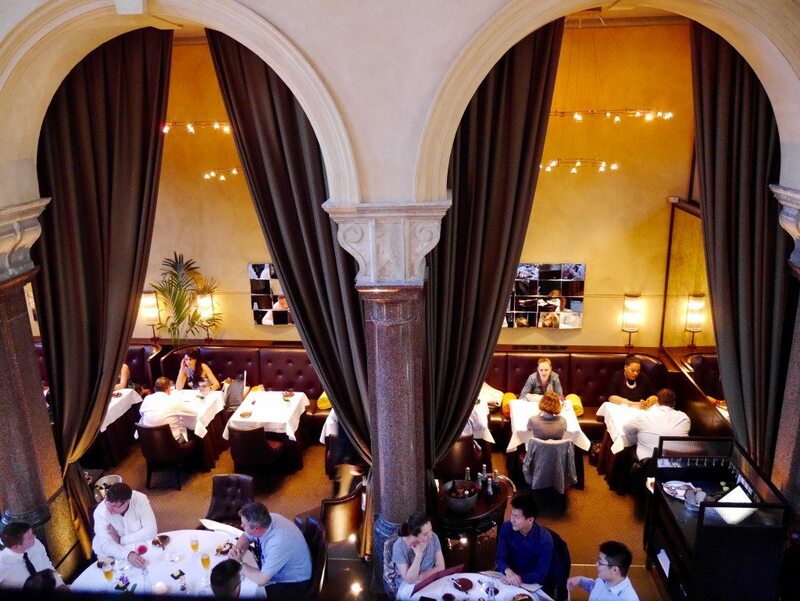 I love Galvin La Chapelle,, when we went, an accordionist was playing which added to the ambiance.